The Early Records of the Town of Providence is a set of 21 volumes that provides a transcription of many of the earliest record books of Providence, Rhode Island, over the period of 1636 to 1750. The books were compiled in the late 1800’s and early 1900’s. They are short books, and fairly readable (although original spelling is maintained). 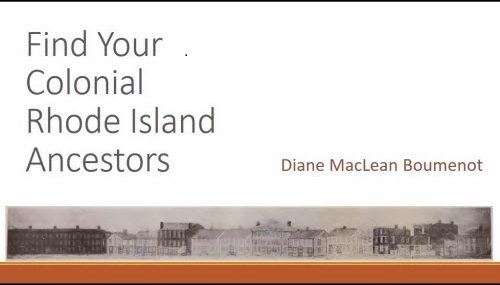 They represent a unique and powerful glimpse into the lives of the early Providence settlers – their life events, businesses, laws, misdeeds, families, property, sense of community and ambitions. The books are well worth perusing for more than just an index to our individual ancestors. Because of the separation of church and state when Providence was founded by Roger Williams and others, the early town records encompassed not only laws, taxation, court cases, probate and deeds but also vital records, including marriage banns, and some cemetery records. The uncertain early relationships between Providence, Newport, Portsmouth and Warwick are apparent in the pages, as well as the growth of the settlement in Providence and the tensions that arose in the distribution of land and resources. In the earliest years, Providence encompassed what are now other towns in Providence County, so records could be in the books for those areas, such as Cranston and Smithfield. The settlement at Providence was damaged during King Phillips War (1675-1676) and for this and many other reasons town records are incomplete and somewhat scattered. There is no clear progression of topics and dates from volume to volume. Each book contains a thoughtful introduction to the status of the particular records found there and I would encourage people to examine those pages. The latest record I saw was about 1750. What follows is a brief overview of the contents of each volume, plus a link to where each one can be found and downloaded (in most cases, from Archive.org). The links were provided to me by a blog reader in England, who knew that others would like to have easy access to them. Thanks! This entry for my 9th great grandfather Michael Phillips, from volume 5, page 151, indicates that he may have died before 1676. I did not know that. Each book is well indexed, but a compiled index of all 21 volumes was produced by Richard LeBaron Bowen and published in 1949 by the Rhode Island Historical Society. The index book begins with a synopsis of the contents of each book (far more comprehensive than what you see below), followed by the index (with corrections from the original indexing) and an interesting analysis of how the indexed names compare to other compiled lists of early Rhode Island families, for instance, Austin’s Genealogical Dictionary of Rhode Island. The index book is available online here, and can be downloaded from Archive.org directly through this link. Below are each of the 21 volumes and an indication of what is in them. Vol. 1 is available for browsing at this page, or download directly from Archive.org by clicking here. It will be observed that the book, analytically, is divided into two parts ; that is, that it has been used for two different and distinct purposes ; first, for recording evidences of land titles and other instruments ; and, secondly, for the minutes of meetings for town purposes. One end of the book was probably used for one of these purposes and the other end for the other. Vol. 2 is available for browsing at this page, or download directly from Archive.org by clicking here. Richard Pray, my 11th great grandfather “hath taken vp the Sharpe peece of land lying neere the place where Rich watermans Great Cannoo was made.” From volume 2, page 17. Vol. 3 is available for browsing at this page, or download directly from Archive.org by clicking here. Vol. 4 is available for browsing at this page, or download directly from Archive.org by clicking here. 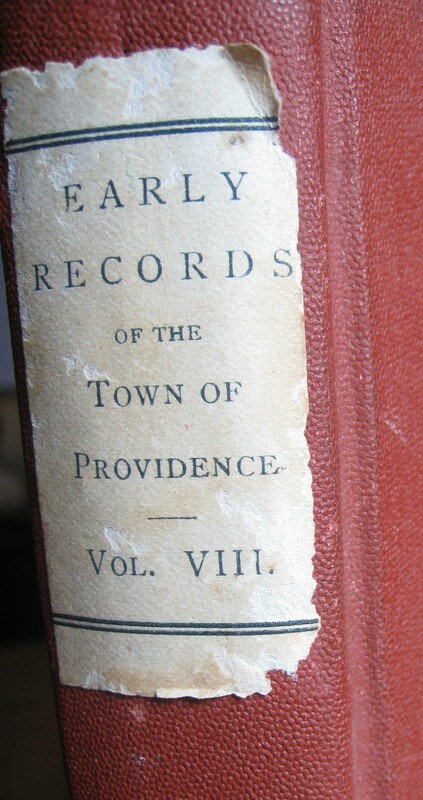 This printed volume completes the records contained in the third manuscript book, entitled “Third Book Town of Providence A and B,” otherwise called “The Book with Brass Clasps.” It also completes the series of books that were in use for the earliest records of the town. Vol. 5 is available for browsing at this page, or download directly from Archive.org by clicking here. Vol. 6 is available for browsing at this page, or download directly from Google.com by clicking here. A 1691 warning that he will not pay the debts of his wife, from Ephraim Pierce. The books sometimes served purposes later served by newspapers. from volume 4, page 80. Vol. 7 is available for browsing at this page, or download directly from Archive.org by clicking here. The period succeeding the time embraced in the last named volume was one of disaster to the town, for the Indian War which had raged with varying success throughout the New England Colonies was then brought within the confines of Rhode Island. During a part of this period, previous to March 28, 1676, and for some time thereafter the town was practically deserted, its business well nigh suspended and a portion of it destroyed by the ravages of the Indians. The townsmen however carried on such governmental affairs as were actually necessary, and during this time Roger Williams held the office of Town Clerk. Some of the records during his incumbency are now extant, but it is not thought that all have been preserved. Vol. 8 is available for browsing at this page, or download directly from Archive.org by clicking here. The material contained in this volume consists largely of layouts of various highways in and around Providence. Through the courtesy of J. Herbert Shedd, City Engineer, the commissioners have been able to identify nearly every one of these highways, and foot notes are added to show the present street or highway intended by the crude and indefinite courses and boundaries given in the originals. The remaining entries consist of a few town meeting records, records of coroners’ inquests, indentures of apprenticeship and records of marriages, while a part of the book is taken up with entries relative to stray cattle, reports of wolf killers and other miscellaneous records. Vol. 9 is available for browsing at this page, or download directly from Archive.org by clicking here. The proceedings recorded in this volume refer almost entirely to the administration of probate affairs, for little else was brought to the Town Council for consideration except occasional requests or liquor licenses and for permission to keep public houses of entertainment. Vol. 10 is available for browsing at this page, or download directly from Archive.org by clicking here. Vol. 11 is available for browsing at this page, or download directly from Archive.org by clicking here. 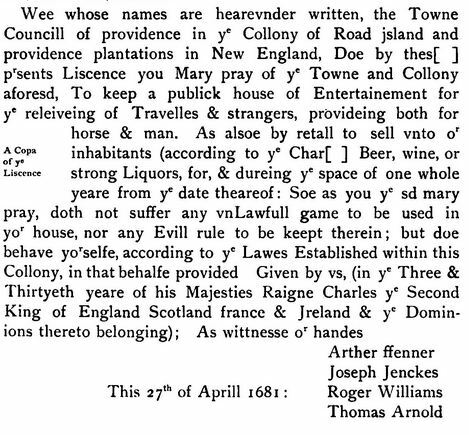 My 10th great grandmother Mary (—-) Pray was, with her husband Richard, granted a public house license in Providence as early as 1655. This license, in 1681, may refer to Mary, who had separated from Richard in 1667. It is from volume 6 page 29. This book contains the proceedings of the Town Council, sitting as a court of probate, and is devoted almost entirely to this class of records, although the granting of tavern licenses, with the attendant privilege of selling liquors, occupied some space. Vol. 12 is available for browsing at this page, or download directly from Archive.org by clicking here. The record book known as “Town Meeting No 2 1716 1721” which is here produced in type purports to contain the proceedings of the town meetings between those dates but in fact it also contains records for the years 1722, 1723, 1724 and 1725. A careful examination of it, leaves one somewhat in doubt as to just what this book was intended to be, for though it has many features about it to convey the impression that it is the original book of record there are likewise certain indications that it was used by the town clerk as a “Blotter” in which to make memoranda of the town proceedings previous to the more extended record. The perplexing irregularity of dates as shown in its present condition probably resulted from a lack of care in placing the sheets in proper order when the volume was bound up many years ago, and the incongruity of the title doubtless arose from the fact that, as bound, proceedings for the year 1721 come upon the last page of the manuscript book, thus misleading the person in charge of the binding into the belief that 1721 was the latest date referred to in the volume. Vol. 13 is available for browsing at this page, or download directly from Archive.org by clicking here. It Is the first volume which was particularly used for the entry of land evidences and similar documents, and marks a period when the growth of the town demanded a more systematic method of keeping its records. Vol. 14 is available for browsing at this page, or download directly from Google.com by clicking here. These papers are decidedly miscellaneous in character and include petitions, letters, reports, depositions, tax lists, and nearly every other kind of public document in use in the early days of the Providence settlement during the time they cover, which extends from 1639 to 1682. The Commissioners have reproduced these papers in type with all the imperfections of spelling and arrangement, believing that any editing or revising would detract from their value. Vol. 15 is available for browsing at this page, or download directly from Archive.org by clicking here. Vol. 16 is available for browsing at this page, or download directly from Archive.org by clicking here. … these papers are of a miscellaneous character and include nearly every variety of documents of a public nature. Vol. 17 is available for browsing at this page, or download directly from Archive.org by clicking here. 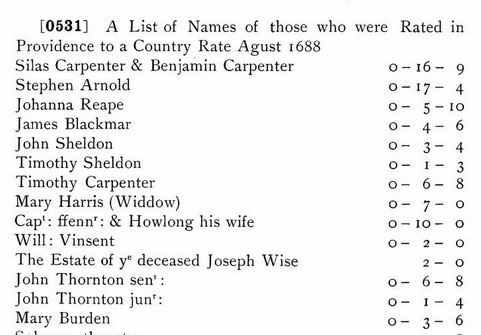 An example of a 1688 tax list that would show you, for instance, that Mary Harris was a widow, that there were at least two adult John Thorntons, and some indication of the death of Joseph Wise. From volume 17, page 122. On January 25, 1894, the Joint Standing Committee of the City Council on the North Burial Ground requested the City Engineer to compile and prepare for the use of said committee all the material on record from the earliest period in the history of the town of Providence up to that date, relating to the North Burial Ground. The growth of that institution with its changes of boundaries and the acquisition of territory made it absolutely necessary that there should be readily at hand the various records and data relating to this burying ground under the management and control of the municipality. Vol. 18 is available for browsing at this page, or download directly from Archive.org by clicking here. Volume 19 “Being official records and documents of title and proceedings relative to the North Burial Ground.” (continued from previous volume). Vol. 19 is available for browsing at this page, or download directly from Archive.org by clicking here. Vol. 20 is available for browsing only at this link on HathiTrust, and cannot be downloaded as a whole book. “Second Part of the Second Book for the Recording of Deeds and called Deed Book No. 2”. The earliest date is 3 Feb. 1661 and the latest date is 12 Mar. 1712/13. Vol. 21 is available for browsing at this page, or download directly from Archive.org by clicking here. The Records of the Colony of Rhode Island. Arnold’s Vital Records of Rhode Island. For those with Ancestry.com subscriptions, an online index can also be found here. The first 18 volumes were produced by record commissioners Horatio Rogers, George Moulton Carpenter, Edward Field, with volumes 19 and 20 being compiled by William E Clarke, Daniel F. Hayden, and William G. Brennen, and volume 21 by William C. Pelkey. I enjoyed perusing these volumes, and I know I will continue to do so. 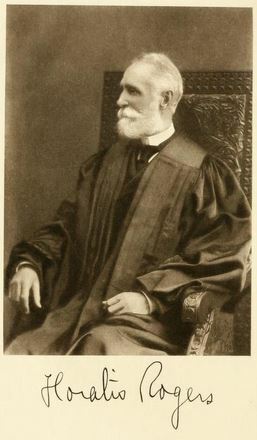 Judge Horatio Rogers, 1836 – 1904, one of the record commissioners who compiled the books. From frontispiece, volume 18. Thank you, Diane, for taking the time to compile this fabulous post with links to numerous Rhode Island resources. 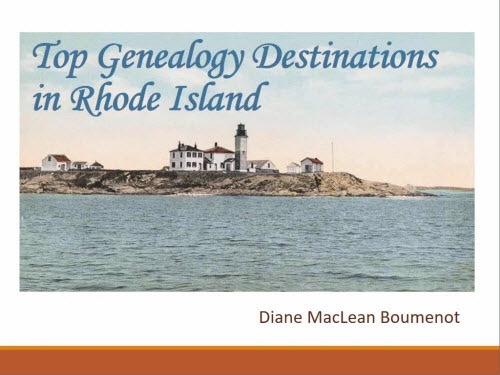 I look forward to exploring this material as I hunt for information on my many Rhode Island ancestors. 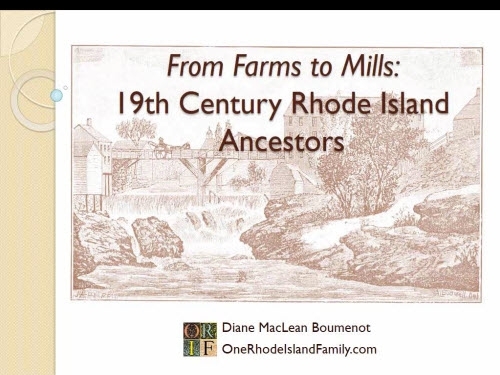 I think I’ll move my ancestors to Rhode Island! I can’t fathom the amount of time it took to write this post. And, thanks for all those who’ll benefit, they are so lucky. Thank you Barb and Mickey! Barb, I really couldn’t believe it when I saw my 9th great grandfather John Malavery’s probate record reproduced in there. This set is a real treasure. What a tremendous undertaking, on your part, to produce this post. Thank you!